Happy 90th birthday, Fred Staton! 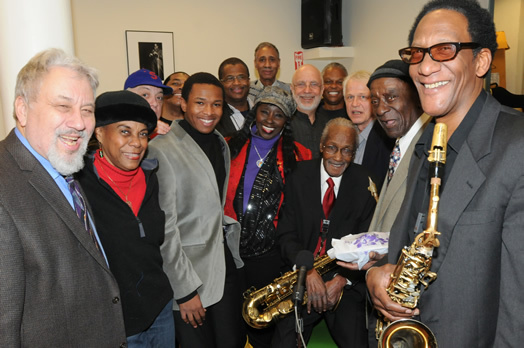 We are in awe of our musical elders, especially saxophonist Fred Staton, who recently celebrated his 99th birthday on Feb. 14 at Local 802. Fred was serenaded by the Harlem Blues and Jazz Band (pictured above; Fred Staton is seated in middle), where he is the senior member. Fred grew up in Pittsburgh and attended high school with Billy Strayhorn. During his career, he has played with Erroll Garner, Billy Eckstine, Howard “Sticks” McGhee, Art Blakey, and Mama Lou Parks and her Savoy Lindy Hoppers. He also toured with his sister, the late Dakota Staton. Fred has been a member of Local 802 since 1954. His birthday party was sponsored by the Jazz Foundation and Fairway Market with support from Local 802, Al Vollmer and Cobi Narita. All photos by Walter Karling.